Black Dragon Wash is located just off of Interstate 70 in the San Rafael Swell west of Green River, Utah. 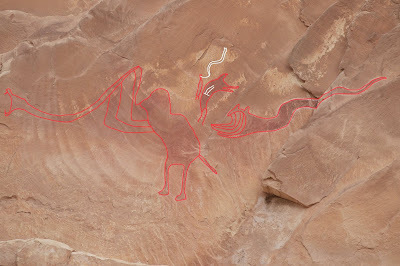 The area is best known for an easily accessible Barrier Canyon style rock art site that has a panel of pictographs that were erroneously misinterpreted to represent a dragon or pterodactyl dinosaur. The site has many more very interesting images that are stretched out over several hundred feet of the canyon walls. To get to the trailhead drive 12.5 miles west of Green River and turn right onto the dirt road at mile marker 147. Be sure to close the gate after passing through it in case there are any cows in the area to keep them off of the interstate. Note that the only legal way to get back onto the eastbound side of Interstate 70 is to keep driving west for another 10 minutes to Exit 131. If you went no further than this you would be more than adequately rewarded by the breathtaking views of the San Rafael Swell anticline whose jagged rocks thrust upward at the sky. Within its seams are numerous canyons and washes where perineal seeps and springs attracted both wildlife and people that left their unique style of art on its sandstone cliffs for thousands of years. Stay on the main road after passing through the gate. It will cross a sandy wash just past the quarter mile point that at times may stop some vehicles. 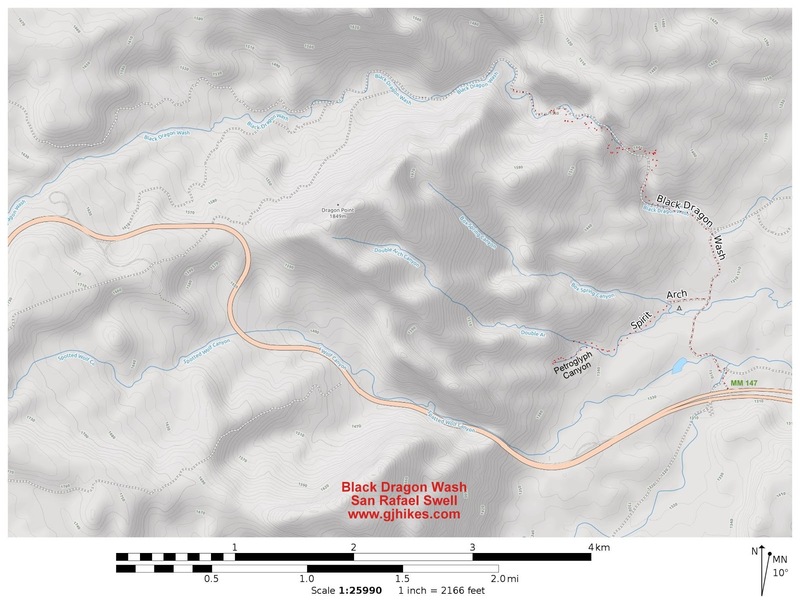 Black Dragon Wash comes up at the 1 mile point from the interstate. We have driven a car this far on past trips. Some vehicles might be suitable to keep going for another couple hundred yards without needing 4-wheel drive but beyond that it becomes a more extreme 4x4 route. If you begin hiking all the way back at the gate your round trip distance will be 3.5 miles to the pictographs and back. Measuring from the mouth of the wash it is a pleasant 3/4 mile hike to the Black Dragon site where there is a sign-in register. Many of the images are so large that they are easily viewable from below without scrambling up the somewhat treacherous talus slope to get a closer look. Binoculars and telephoto lenses will be helpful to see some of the finer details. This is the panel that contains the erroneously named Black Dragon where someone had outlined various images with white so that they would resemble a winged creature. The outline is so suggestive that it is hard to see what is really there. Pardon our crude tracing but the panel is actually composed of at least 6 individual images that are of the common style seen at other nearby sites. On the right there is a large snake with its mouth wide open. Above it is a common image of a shaman or other person that looks like it is, for lack of better words, casting a spell or simply soothing the snake. Above that image is a smaller person that appears to have a snake in its mouth. Off to the far left is another large snake with its mouth open and fangs protruding that is being picked up by a person that is stooping over to grab it by the tail. The Snake Dance was an important ceremony that the Hopi Indians carried on into historic times. There is even an old black and white video on YouTube of a ceremony that was witnessed by Theodore Roosevelt. If you pause the video near the 4 minute mark you should be able to make out dancers carrying snakes in the hands and mouths. The former President related a rousing account of the ceremony and its preparations. Black Dragon Wash may have been a meeting place for such a ceremony. A couple of other iconic Black Dragon Wash images can be seen to the right where natural ripples in the rock add a sunbeam effect to the panel. Even further down the cliff to the right beneath an overhang are hundreds more images that appear to be of a different style. In a lot of ways they are even more intriguing than the larger images. This photo is only a small portion of the images that are on the left side of the overhang. A few hundred yards on up the canyon past the Black Dragon site there is a large boulder on the right side of the wash and a short distance up the slope. It has what looks like a fertility scene. On one side there is a man with an erection that is holding a snake. On the other side is a female that we will assume was his mate. Near the woman is a Kokopelli flute player which is also sporting an erection. Looking closely you can see that Kokopelli's knapsack is full of seeds or some other small objects. Both the male and female images have a crescent of similar looking objects below them while the males body is decorated with even more of them. On this day we continued exploring on up the wash until we reached another Day Use sign before turning around. Enroute we discovered a cave that appeared to have been inhabited once upon a time. While most people visit Black Dragon Wash just to see the rock art the natural beauty of its rugged geology is almost as spell binding as maybe the Snake Dance was meant to be. 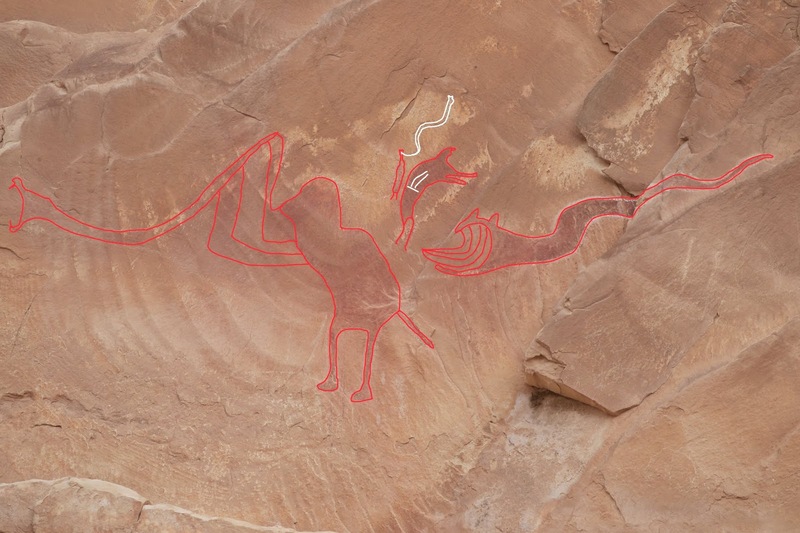 It only takes about an hour to just stop and see the Black Dragon pictographs but there are a few primitive campsites in the area for those looking to stay longer and explore Petroglyph, Double Arch or Box Spring Canyons. You can also take advantage of the 4wd underpass to access parts of the reef on the south side of the interstate. 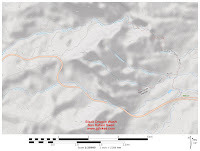 The old trail through Black Dragon Wash extends for quite a few miles on up to the Buckhorn Wash Road. We have often thought about making use of a shuttle vehicle and riding our mountain bikes through it in the downhill direction. If you would like to see it for yourself then all you have to do is 'Take a hike'.